Who’s Who and What’s New? This unselected community exhibition is run annually by the Art Museum. From students to both amateur and established artists, this exhibition is a showcase of current art in the Bay. 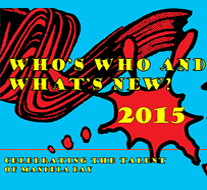 This group exhibition is designed to celebrate and promote the diversity of art produced in Nelson Mandela Bay. It aims to encourage new and upcoming artists and to publicise practicing visual artists and visual art groups. The exhibition has no theme and artists old and young, professional or first timers are invited to submit their latest and greatest works and be a part of the Bay’s brightest and most diverse group exhibition. The exhibition will be open to the public on 2 April and will close on 3 May 2015. Opening function: Wednesday 8 April 2015 at 17H30.